Andes Technology today announced its newly-released AndeStar™ V5 CPU cores – N25/N25F, NX25/NX25F, A25 and AX25 – support the Andes Custom Extension™ (ACE) feature. The AndeStar™ V5 architecture is the result of RISC-V technology incorporated with Andes innovations based on rich experience in serving embedded processor IPs for over 10 years. The ACE feature enables embedded designers to add customized instructions on their Andes V5 CPU cores with ease. RISC-V is an open processor instruction set architecture (ISA) standardized by the non-profit RISC-V Foundation. It is rapidly gaining popularity in many markets because of its compactness, modularity and extensibility. In addition to general-purpose usages, RISC-V specification encourages customized instruction extensions to facilitate the design of Domain-Specific Architecture/Acceleration (DSA) for applications such as Artificial Intelligence/Machine Learning, AR/VR, ADAS, and next generation storage and networking. Acceleration through customized instructions can boost application performance significantly while maintaining the programmability. Despite the huge benefits that may bring, however, most SoC teams find it difficult to add customized instructions. This is because designing new instructions requires major efforts and CPU talents to modify the existing processor hardware and associated software tools and make sure they work together. Andes Technology fills this gap by providing the ACE design environment which greatly simplifies the steps to add instructions. By preparing a description file that describes instruction input/output interfaces and instruction semantics in C and a concise Verilog file implementing the RTL logic based on the given interfaces, designers can execute the Custom-OPtimized Instruction deveLOpment Tools™ (COPILOT) to generate the extended CPU and software toolchains in minutes. 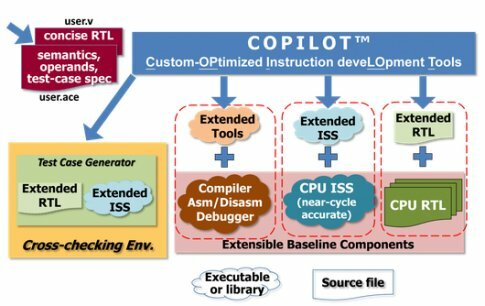 The COPILOT tool is the key to the automatic creation of ACE instruction environment. It offloads all housekeeping RTL design tasks such as opcode selection, instruction decoding, operand mapping, input operand accesses, dependence checking and result gathering. Using ACE needs no expertise in processor pipeline design, thus minimizing the learning curve. Designers can then focus on the implementation of powerful functionalities rather than spend time figuring out how to interact with CPU pipeline. The most powerful features of ACE are the constructs to define high level instruction semantics and enable the automatic RTL generation. For example, the vector construct allows developers to design a vector instruction as simple as its scalar counterpart, and the background construct enables parallel execution by allowing long latency ACE instructions to proceed in background. Designers can also use custom-defined registers (ACR) and memories (ACM) with arbitrary bit widths to have wide inputs and outputs processed by ACE instructions. These ACE features can contribute to significant performance improvements. COPILOT also facilitates verification process in addition to its usage on toolchain generation. It can generate verification patterns and cross-checking environment that help designers to verify the correctness of their instruction designs. Andes Custom Extension™ for AndesCore™ N25/N25F, NX25/NX25F, A25 and AX25 is available for license now. To explore ACE’s full capabilities, please contact Andes Technology for more information. The company delivers the best super low power CPU cores, including the rising star RISC-V series with integrated development environment and associated software and hardware solutions for efficient SoC design. Up to the end of 2017, the cumulative amount of SoCs containing Andes’ CPU IP reaches 2.5 billion.